Visiting Angels Franchise Opportunities Positioned for Success! Since 1998, Visiting Angels franchise opportunities have been providing entrepreneurs with a chance to make an impact in their local communities. The caregivers hired by our franchise owners provide professional care and support to seniors and the disabled around the country. Visiting Angels has established hundreds of franchised senior home care agencies across the United States. Visiting Angels franchise opportunities are currently available throughout the United States and internationally. Our senior care franchise opportunities come with a wide range of support services. From one-on-one and regional group support meetings to annual franchisee conferences, there are many opportunities to learn from our Operations Directors and your fellow franchise owners. Visiting Angels home care franchise opportunities include partnership programs which offer discounts to both franchise owners and care recipients. Our extranet and weekly updates provide our franchise owners with ongoing support and a wealth of relevant information to help them grow their businesses. No other franchised home care company in America has achieved stronger branding of its name and services. All Visiting Angels franchise opportunities come with a strong commitment to marketing at both the national and local level. When you take advantage of Visiting Angels franchise opportunities, you will enjoy the benefits of tried and tested marketing campaigns. While our franchise owners have enjoyed countless "word of mouth" referrals, we also gather hundreds of leads each month through our targeted marketing campaigns. New franchisees, as well as our most experienced franchise owners, benefit daily from our Corporate Lead Distribution System. With our franchise opportunities, you will always be backed by a team of marketing professionals committed your success. Our ongoing national advertising campaign (print media, Internet and broadcast media including both radio & TV) reaches millions of Americans daily. The result is thousands of home care client leads distributed each month to our franchisees. 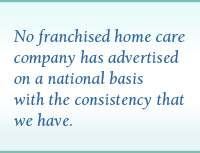 No franchised home care company has advertised on a national basis with the consistency and success that we have. Visiting Angels has been ranked by Entrepreneur Magazine as one of the top rated and fastest-growing franchises in America. Get started with Visiting Angels franchise opportunities today! .